Far from a ‘chuck it and chance it’ daylight-hours-only tactic, to be deployed only when all else fails, zig fishing could be your best chance of a bite around the clock, throughout the year. So why isn’t it more widely adopted? An old school carper friend of mine likens zigging to lure fishing; going so far as to suggest in feigned disgust that zig fishers should be “sponsored by Rapala”. Perhaps he has a point. But the fact is, zig fishing can – and frequently does – deliver the goods when all else save gelignite fails. For those that don’t know (where have you been?! ), a zig is essentially a long pop-up rig. And I do mean long: positioning a buoyant hookbait, often, just inches below the surface of the lake. Madness, you say? Couldn’t disagree, really. But it works. And it works throughout the day, the night, and all year round. The reasons for its efficacy are, I would suggest, baffling at best. Suspending a bait (which may be something as unappealing as a sliver of black foam) yards off the deck? I mean: how unrealistic can you get, right. Hence the comparisons with lure fishing, I guess. But pause a moment. Match anglers think nothing of presenting their baits up in the water, when waggler fishing for carp. And carp, be they ‘match’, ‘specimen’ or whatever label you choose to attach to them, are still… carp. So: do you have the audacity to really give zig fishing a proper go? By that I don’t mean chuck one out for a half-hour, more in hope than expectation, whilst watching reruns of The Challenge on your tablet. I mean committing to giving the technique a proper go – experimenting with hookbaits, spots and depths to maximise your chances of success. Mm. This latter is I think the reason so few anglers have truly embraced the technique. That ‘third dimension’ – depth– adds another level of complexity; one variable too many. It’s no longer enough to get our heads round watercraft, feature finding, bait, rigs, and all the rest; now we have to gauge how far off the deck we should be presenting our bait to intercept cruising – or, in winter, tightly shoaled – carp. May be my purist pal has a point: zigging is not bait fishing in the traditional sense. Rather, like fluff chucking for salmon, it’s designed to trigger not a feeding response, but an involuntary, almost predatory, reaction. Nonetheless, far from a last resort, zigs are – for many of the country’s better known carpers – a first-choice tactic, throughout the winter. Well, as we all know, in cold water, carp shoal up tightly. And once winter really ‘sets in’, where the carp are is where they’ll likely stay. Sure, they will move at times; but they will spend long periods in the same area; an area in which they feel most comfortable. Which, for reasons of pressure and temperature may well be midwater. It therefore follows, if you can present a hook bait right in front of their noses, your chances should be vastly improved. And here again the comparisons with jigging et al are well made. If it’s suitably buoyant, sufficiently attractive, and presented at eye-level, why wouldn’t Mr Cypry deign to open his gob? Given the importance of accurate bait placement, keeping your eyes peeled for ‘signs’ is critical. T’was ever thus. But consider this: however precise your cast, a traditional bottom bait rig may still not be anywhere near showing fish, which could actually be ten feet or more off the deck, in 20 feet of water. The solution is play around with the depth (or should that be ‘height’) of your presentation – a doddle with an adjustable zig float – until you find the right level; and hopefully elicit a take. As you would expect, the first few minutes following the cast can be best for a bite. So you can – indeed should – recast your zigs regularly. So, where to begin, depth-wise? Well, my preference is to start a couple of feet below the surface, and experiment from there. In winter especially the slightest difference can spell the difference between success and failure. So break out the marker float to check the depth. And the distance sticks to ensure you hit the spot every time. On venues or in swims where the depth is fairly uniform, you can use fixed zigs, and simply shorten your hooklinks. In areas with considerable depth variation, a zig float or pike-style sub float will enable you to make necessary adjustments by retrieving or paying out line. Hookbait wise, the first consideration has to be: size. General consensus is that small baits work best – perhaps because they mimic the carp’s natural food. So, your bait just needs to be sufficiently buoyant to pop up a small – size 10-12- hook. As to the rest… Some days, bright colours work brilliantly. On others, blacks and browns do the do. 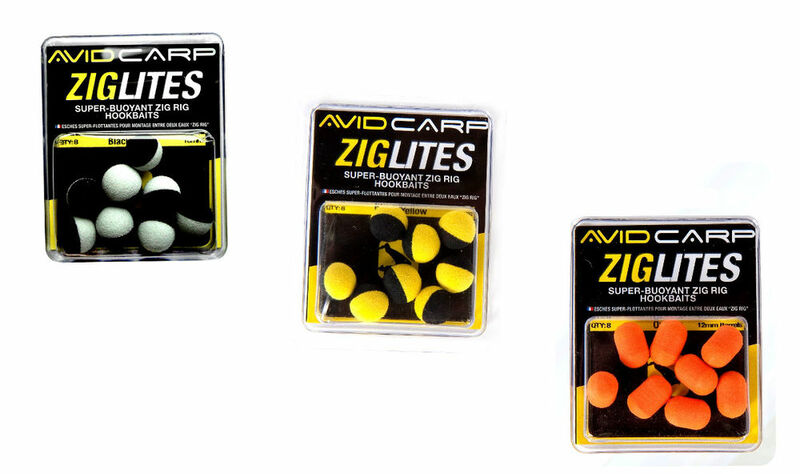 Hence the appeal of Avid’s ultra-buoyant two-tone ZigLites, which are available in black-yellow, black-orange, black-green and black-white variants. The theory: dark colours are more effective when viewed from below, silhouetted against the skyline; lighter colours are easy to spot from above. Other alternatives include whittled-down popups; and custom-designed ‘zig bugs’, which are available from a number of companies and effectively ‘match the hatch’ – reflecting the fish’s natural insect diet. Glow-in-the-dark baits, popularised by Frank Warwick and available in the Enterprise range, are also effective, especially at night. But for many a simple slither of black foam remains the go-to bait. Doubtless, carp often take zigs purely out of curiosity. So, again just as in lure fishing, imparting movement – twitching the hookbait – can trigger a bonus take. But in the spirit of appealing to all the senses, use of booster liquids and sprays can only enhance the bait’s attraction. Tying up a number of rigs prior to your trip eliminates the need to wrestle absurdly long lengths of mono with frigid digits. But be sure to tie them longer than you think you’ll need – allowing you to cut them down to whatever length is actually required on the day. Tying rigs isn’t the only challenge, of course; casting hooklinks over six feet or so can be tricky too. With which in mind, here’s a crafty ‘hack’: try wrapping a piece of dissolving rig foam around your hooklink, adjacent to the lead clip. 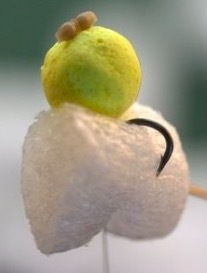 Then simply nick your hook into the foam prior to casting – effectively halving the length of the hook link. 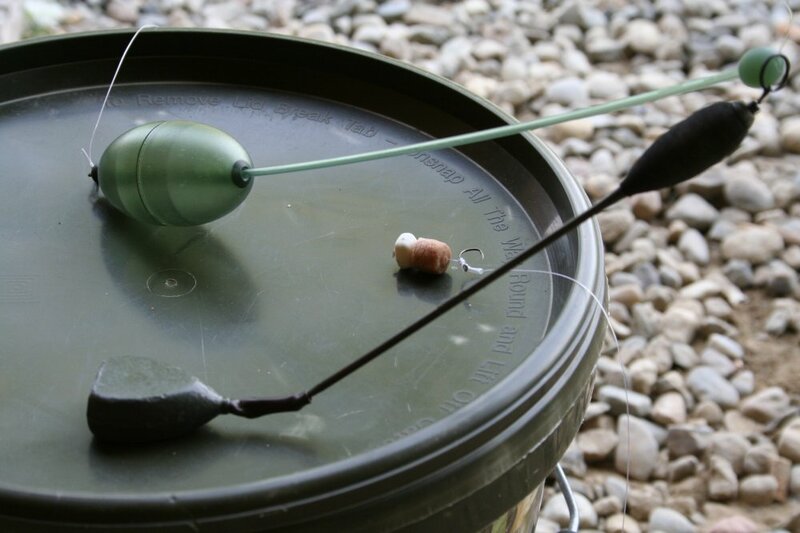 Alternatively, you can drop your hook into a regular drinking cup, with the hooklink coiled above, prior to casting (in this case, using a piece of foam on the hook, to stop it from catching on anything during the cast itself). In either case, don’t forget to feather the line down towards the end of the cast– so kicking out the hook, and thus eliminating tangles. And that’s pretty much all there is to this zigging malarkey. Save to state the obvious: playing carp on ultra-long hook lengths can be a challenge; a challenge you’re far less likely to win if your lead, however light, remains attached. So set your clip to ensure you drop the lead on the take, every time – giving you the best possible chance of converting your next bite into a fish on the bank. Chances are that bite will be the first of many, should you choose to adopt zigging into your winter carp fishing repertoire.